Almost all landscapes have plants that become diseased with one of the powdery mildew fungi. Although the fungi that cause powdery mildew are usually different on different plants, all of the powdery mildew diseases are similar in appearance. In most cases, prompt recognition and control actions can prevent severe damage to plants from powdery mildew diseases. 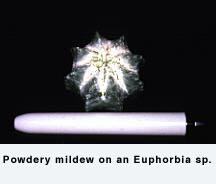 Powdery mildews, as the name implies, often appear as a superficial white or gray powdery growth of fungus over the surface of leaves, stems, flowers, or fruit of affected plants. These patches may enlarge until they cover the entire leaf on one or both sides. Young foliage and shoots may be particularly susceptible. Leaf curling and twisting may be noted before the fungus is noticed. Severe powdery mildew infection will result in yellowed leaves, dried and brown leaves, and disfigured shoots and flowers. Although it usually is not a fatal disease, powdery mildew may hasten plant defoliation and fall dormancy, and the infected plant may become extremely unsightly. On roses, uncontrolled powdery mildew will prevent normal flowering on highly susceptible cultivars. Powdery mildew fungi infect almost all ornamental plants. They are commonly seen only on those plants more naturally susceptible to the disease. Susceptible woody plants include some deciduous azaleas, buckeye, catalpa, cherry, a few of the flowering crabapples, dogwood, English oaks, euonymus, honeysuckle, horse chestnut, lilac, privet, roses, serviceberry, silver maple, sycamore, tulip tree, some viburnums, walnut, willow and wintercreeper. Powdery mildews are also common on certain herbaceous plants, such as chrysanthemums, dahlias, delphiniums, kalanchoes, phlox, Reiger begonias, snapdragons and zinnias. Remember that each species of powdery mildew has a very limited host range. Infection of one plant type does not necessarily mean that others are threatened. For example, the fungus that causes powdery mildew on lilac does not spread to roses and vice versa. Most powdery mildew fungi produce airborne spores and infect plants when temperatures are moderate (60 to 80 degrees F) and will not be present during the hottest days of the summer. Unlike most other fungi that infect plants, powdery mildew fungi do not require free water on the plant surface in order to germinate and infect. Some powdery mildew fungi, especially those on rose, apple, and cherry are favored by high humidities. Overcrowding and shading will keep plants cool and promote higher humidity. These conditions are highly conducive to powdery mildew development. 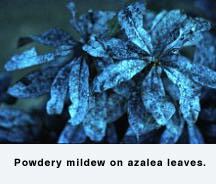 Before using fungicides you should attempt to limit powdery mildews by other means. 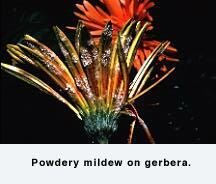 The following cultural practices should be beneficial for controlling powdery mildews. Purchase only top-quality, disease-free plants of resistant cultivars and species from a reputable nursery, greenhouse or garden center. Horticulturists in the green industry and Extension offices should be consulted concerning the availability and performance of resistant varieties. Prune out diseased terminals of woody plants, such as rose and crabapple, during the normal pruning period. All dead wood should be removed and destroyed (preferably by burning). Rake up and destroy all dead leaves that might harbor the fungus. Maintain plants in a high vigor. Plant properly in well-prepared and well-drained soil where the plants will obtain all-day sun (or a minimum of 6 hours of sunlight daily). Space plants for good air circulation. DO NOT plant highly susceptible plants--such as phlox, rose, and zinnia--in damp, shady locations. Do not handle or work among the plants when the foliage is wet. Water thoroughly at weekly intervals during periods of drought. The soil should be moist 8 to 12 inches deep. Avoid overhead watering and sprinkling the foliage, especially in late afternoon or evening. Use a soil soaker hose or root feeder so the foliage is not wetted. In many cases, powdery mildew diseases do little damage to overall plant health, and yearly infections can be ignored if unsightliness is not a major concern. 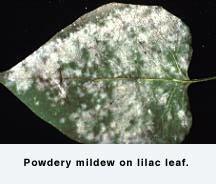 For example, lilacs can have powdery mildew each year, with little or no apparent effect on plant health. 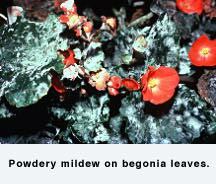 On some plants, powdery mildews can result in significant damage. Thus, fungicides must be used to achieve acceptable control. For best results with fungicides, spray programs must begin as soon as mildews are detected. Spray on a regular schedule, more often during cool, damp weather. Use a good spreader-sticker with the fungicides. 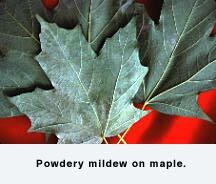 Be sure and cover both surfaces of all leaves with the spray. Fungicides generally recommended for powdery mildew control include: Triadimefon (Bayleton, Strike); Triforine (Funginex), Thiophanate-methyl (Cleary's 3336, Domain) and Propiconazole (Banner).